I arrive at my favorite spot, unload my Pro Trekker backpack and set up my tripod. Within minutes my lens is trained on my quarry and the Provia F is advancing through my camera. I gleefully shoot one frame-filling photo after another in this secret haven of mine. And I don’t mind telling you: This secret place is my living room. Now, I love to be out in the wilderness as much as anyone does, but sometimes family or work commitments rightfully come first. Other times, I’m just too tired, or have too little time to pack up and drive somewhere, yet I still want to shoot. As a compromise, I bring the wilds to me, using the tactics of an Unabashed Armchair Nature Photographer. 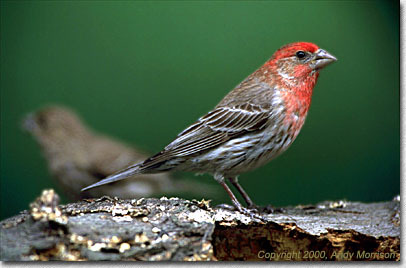 A pair of bird feeders located in front of my home attracts a variety of birds year round. When it’s time to shoot, the feeders come down and my “stage-sets” go up. My props are simple: a small, hollow tree limb secured to a Bogen tripod using a wooden clamp. This is placed outside a living room window, about five to ten feet away, depending on the light and what I’m trying to shoot. Holes drilled in the backside of the limb are filled with sunflower seed, as is a bowl placed on a board behind the setup. The bowl is secured to the board with Velcro, making it easy to detach and refill with seed. All my props, except the tree limb, are out of view of the camera. The birds will hop around the limb grabbing seed from here and there, pausing just long enough for me to capture them in attractive poses. The great thing about armchair nature photography is it allows me to do things around the house or get some much-needed rest, and still take great pictures. I can leave the camera set up and ready to shoot, checking for activity at my convenience. So don’t fret if you’re torn between shooting and staying home, you can do both. 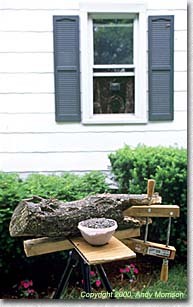 Just hang a few feeders outside your window, set up your camera, put on your favorite television show, relax, and have fun! For bird images, Canon EOS 1n, 300/2.8 L with Canon 2X TC, 540EZ with Better Beamer, Gitzo tripod with Studioball head.